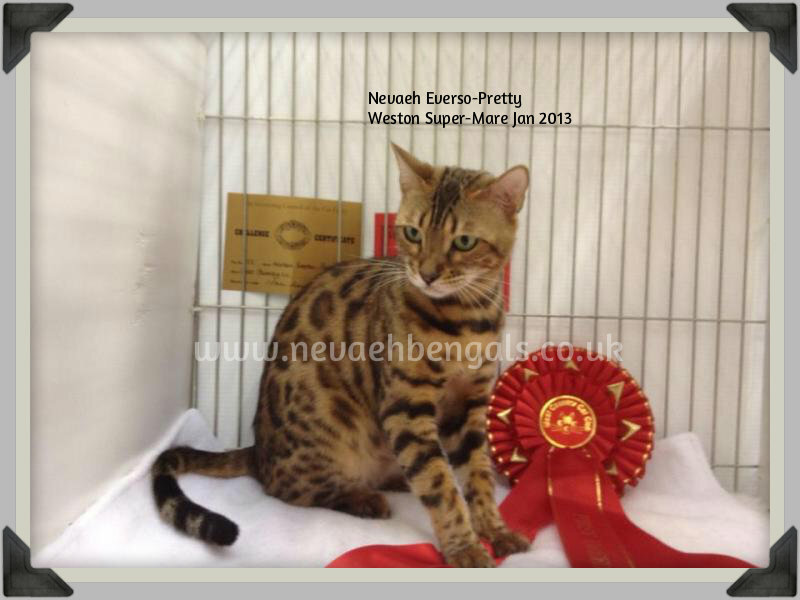 2nd O’Neills NEVAEH EVERSO PRETTY 76 30 Brown Spotted Bengal female born 12/06/2011. Very nice Bengal girl dark brown markings on orange ground with clear contrast, broad medium wedge with rounded contours, high cheek bones, gentle curve forehead to nose, very slight concave curve to profile, slightly puffed nose leather, strong muzzle, pronounced whisker pads, chin slopes away a little, level bite, thick neck, medium ears, pointing forward, set even side to top following face contours, medium rounded oval shape, mid green eyes, slanting to base of ear, large body, long, sleek and muscular, good depth of flank, high on rear legs, strong medium limbs, large round paws, medium tail, thick and fairly even to rounded tip, medium length, pelt like luxurious soft close lying coat, large size random rosette spots on body, some elongated at shoulders, dark brown markings on orange ground with rufus gold glitter, mascara, spectacles, cheek lines, M, scarab, lines over head and breaking down spine, bold chin strap and necklets, leg bars, tail rings, solid dark tail tip, tummy spots, desirable white on whiskers and chin, very good temperament and condition. promising girl who was well presented and easy to assess. 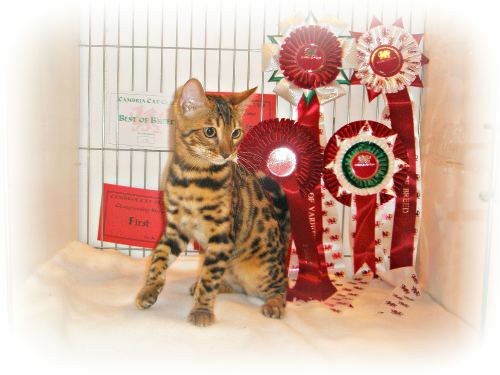 1st & BOB O,Neill NEVAEH EVERSO PRETTY 76 30 Brown Spotted Bengal female born 12/06/11. Super Friendly, noisy baby girl wonderful black markings on pale golden ground with very clear contrast, broad medium wedge with rounded contours, high cheek bones, head small in proportion to body, gentle curve forehead to nose, slight concave curve to profile, puffed nose leather, rounded muzzle, pronounced whisker pads, strong chin, level bite, thick neck, medium to small ears, pointing forward, set even side to top, following face contours, medium rounded oval shape, muddy hazel eyes, slanting to base of ear, medium to large body for age, long, sleek and muscular, good depth of flank, high on rear legs, strong medium limbs, round paws, medium tail, thick and even to rounded tip, medium length, pelt like luxurious soft close lying kitten coat, large size random rosette spots on body, black markings on pale golden ground with good rufus gold glitter, mascara, spectacles, cheek lines, M, scarab, lines over head and down spine, bold chin strap and necklets, leg bars, tail rings, solid black tail tip, tummy spots, desirable white on whiskers and chin, very good friendly talkative temperament and superb condition. Congratulations on BIS Foreign Kitten.